I make my own cold process soap. I have a tub full of it in my garage. I no longer buy shampoo or conditioner. I no longer buy body wash. I use apple cider vinegar on my hair instead of conditioner. I wash my face with coconut oil – organic hexane-free extra virgin coconut oil. I refuse to dye my hair anymore as much as I want to get rid of all this gray. I’m now researching how to make my own deodorant and my own toothpaste. I’m transitioning all my cookware to stainless steel, glass, ceramic and cast iron. I avoid foods in cans and I don’t eat any processed foods. I refuse to/can’t eat anything with soy in it (it’s a personal problem and I’ll spare you the details). I use glass “tupperware” and my microwave’s primary function is to store food so the cats don’t get it. We carry a basket at the farmers market and don’t use any bags for our produce – everything just gets dumped into the basket. My life has really changed over the last decade. In college I ate nothing but processed food, dyed my hair bright colors, and cooked on the cheapest cookware I could find. The microwave cooked more meals for me than the stove. It’s been over the years that I’ve slowly been eliminating products from my life. Soy was probably the first one but it was not by choice. But looking for the reason why I was having a reaction to soy opened my eyes to a whole new world of information and the transition had officially started. K – gotta ask…. how do you make your soap? I’ve tried a couple times and just haven’t been super happy w/ it..
and FYI – love reading the blog, awesome info! What kind of soap are you trying to make? 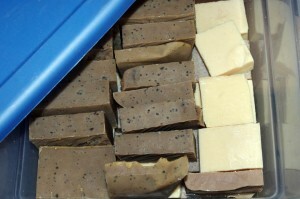 ditto on the soap recipe – that stuff looks yummy! Funny what starts us on the path to living a chosen life. To actually choose what we consume, and how we consume it. My path began by wanting to learn to make bread. And from there it grew to canning all my own food. Starting to grow some of my food. And to examine every “thing” that enters into my life for the value it brings to this chosen life. I’m with you. My next beast to tackle is soap. I would love to learn to make shampoo bars instead of buying them, but every recipe on the net seems to be for body bars. Would you post your recipe sometime? I’m still tweaking the shampoo bar recipe. I really like it but it’s a bit soft for my liking and I need to find a scent that I like. Once I get it worked out I’ll post the recipe. I’m on the path with you. I got recently intrigued by a recipe for bacon fat soap from a book called “Little House in the Suburbs”. Haven’t made it yet; I’m still collecting the bacon fat.